The Iowa Great Lakes Water Safety Council is a great resource for information about the Great Lakes area. Our thanks to them for the following helpful introduction to the lakes that make up the Great Lakes area. Visit their website for more information. Spirit Lake – Spirit Lake (Big) is situated approximately 1 mile north of the City of Spirit Lake. At 5,684 acres, Spirit Lake is Iowa’s largest natural lake. It is approximately 6 miles north/south and 4 miles east/west. Due to its circular shape and large open body of water, its 15.25 miles of shoreline is less that that of its neighboring lakes to the south. The average depth of Spirit Lake is around 17 feet with a maximum recorded depth of 24 feet. The northern edge of Spirit Lake borders the Iowa/Minnesota State line and a majority of its 34,471 watershed acres (approximately 75 sq. miles) are located in southern Minnesota. Spirit Lake offers two state parks and 4 public accesses to this popular fishing lake. Spirit Lake claims some 40 species of fish with 13 species of sport fish sought after by many outdoor enthusiasts. According to various Indian legends, Spirit Lake was believed to be under the guardian watch of an evil spirit. No Dakotah ever dared to cross it in their canoe and no Indian canoes were ever found in the vicinity of this lake by the early settlers. Whether there are demons who dwell in the lake or not, the waters of Big Spirit Lake are never quiet. Little Spirit Lake – Little Spirit Lake is located to the northwest of Spirit Lake and is considered an Iowa/Minnesota border lake. This means that approximately the southern 40% of the lake is situated in Iowa and the northern 60% is in Minnesota. The lake is 618 acres in size and offers 10.1 miles of shoreline. A shallow lake, Little Spirit is only 6 feet deep on average with its deepest point of 10 feet. Since Little Spirit is a border lake, anglers must comply with Minnesota bag limits and fishing seasons as well as Iowa’s fishing regulations. West Okoboji Lake– West Lake Okoboji is located to the south and west of the City of Okoboji and northwest of the City of Arnolds Park. West Lake is the largest of a chain of five connecting lakes, which is considered part of Iowa’s Great Lakes. 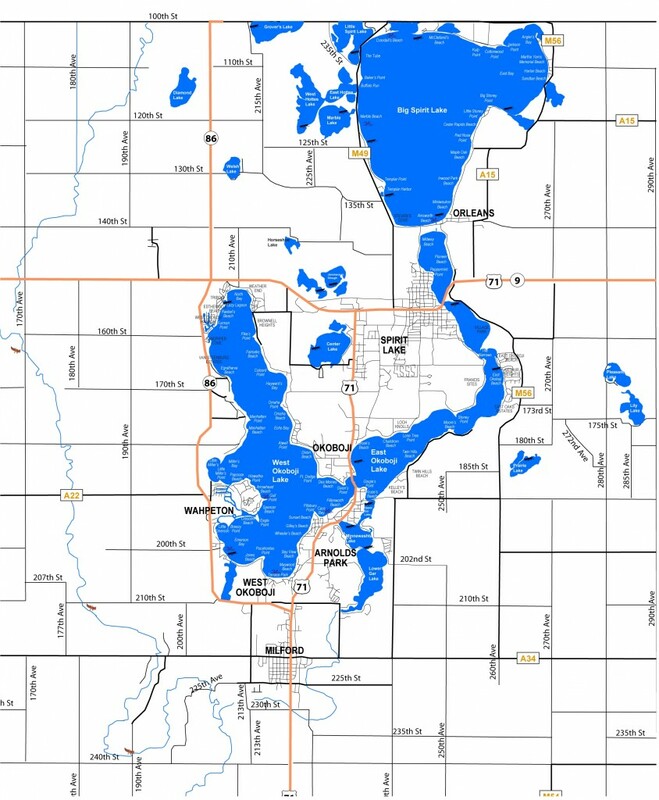 According to information obtained from the Iowa Department of Natural Resources, West Lake Okoboji is comprised of 3,847 surface acres of water with an average depth of 38 feet and maximum depth of 136 feet. There are 19.8 miles of shoreline around West Lake and the natural drainage basin is fed by 13,668 acres of land or approximately 22 square miles. Three State Parks are located along the shores of West Lake, including Pillsbury Point, Gull Point, and Pike’s Point that is located adjacent to the City of Okoboji’s northern city limits. West Lake Okoboji is considered a blue water lake formed by glacial movements retreating north, and is only one of three blue water lakes in the world. More than 47 species of fish can be found in West Lake, with approximately 11 species of popular sport fish. West was called “Minnetonka” by the Sioux Indians and translated into “Great Waters.” The first settlers decided to use a version of the name “Okoboozhy” for both lakes known today as the “Okoboji” lakes. West Okoboji is the second largest in the chain covering 3, 850 acres. It is a glacial lake created by the Wisconsin Glacier 14,000 years ago and has a maximum depth of 134 feet, which makes it the deepest natural lake in Iowa. Subterranean springs help provide the cool, clear, blue water of Iowa’s most popular lake. West Okoboji is about seven miles long and up to two miles in width. Boats can travel to Lake East Okoboji under the Highway US 71 Bridge and a walking bridge. East Okoboji Lake – East Lake Okoboji is the other natural lake delineating the City of Okoboji’s eastern city limits. East Lake and West Lake Okoboji meet at the Highway 71 viaduct where the cities of Okoboji and Arnolds Park also meet. East Lake is a 1,835-acre lake with an average depth of 10 feet and a maximum depth of 22 feet. Of the 16.8 miles of East Lake shoreline, only 6 percent is state owned and about 85 percent is developed. In 2002, East Lake Okoboji was named the location of Iowa’s newest state park. The Elinor Bedell State Park offers access to fishing from shore, camping, picnicking, and playground facilities. The lake’s watershed is comprised of 12,212 acres or approximately 19 square miles.The Indians called the lake “Okoboozhy,” and the name is said to mean “Reeds or Rushes,” as they once surrounded the lake. It has the appearance of a river rather than a lake and is the longest natural lake in Iowa. Upper Gar Lake – Upper Gar Lake connects the south bay of East Okoboji Lake to Minnewashta Lake. At 37 acres, Upper Gar is the smallest of the Iowa Great Lakes chain. This lake is basically a shallow channel connecting two larger bodies of water. The average depth of Upper Gar is 3.5 feet, therefore warranting a maximum 5-mph speed limit on the lake. At its Northern end Upper Gar Lake connects to East Lake Okoboji at the Hinshaw Bridge (near Trigg’s Resort) and at the Southern end it connects to Lake Minnewashta at the Sawmill Bridge. The Gar Lakes were named for their outlet known as Gar Outlet. This was because schools of Gars, a type of fish, were working their way upstream. Originally, there were three lakes known as the Gar lakes, forming a chain about two miles in length, and were called Upper, Middle, and Lower Gar Lakes. Around 1900, the name Middle Gar was changed to “Minnewashta,” which is Dakotah for good or nice. Lake Minnewashta – This lake is the second is a string of three small lakes located on the south edge of East Okoboji Lake eventually leading to the outlet creek of the Iowa Great Lakes. Minnewashta is 126 acres in size with 2.3 miles of shoreline. The Lake is located in the City of Arnolds Park to the south of Okoboji. Highway 71 runs along its Western edge. Average depth of Minnewashta is 10 feet with the deepest point of 16.5 feet. Most anglers fishing Lake Minnewashta are in search of its bass and panfish populations. Lake Minnewashta connects Upper Gar Lake at the Sawmill Bridge and connects to Lower Gar Lake at the Trails Bridge. Lower Gar Lake – The southernmost lake in the entire Great Lakes chain, Lower Gar is a large shallow natural lake with the outflow creek existing at the southwest corner of the lake. Lower Gar Lake has a surface area of 242 acres, a mean depth of 4 feet, and a maximum depth of 6 feet. Lower Gar does drain a sizable 11,374 acre watershed primarily from the Spring Run wildlife management area. During years with low water levels it can be difficult for boat traffic to navigate the shallow muddy waters. The lake level has been raised several times, and the current dam, constructed after the flooding in 1993, has substantially stabilized the level of the lake. Most of the Western portion of the Lower Gar Lake is privately owned, and current development on the east and Northeast sides includes housing and a golf course. Its more sheltered location encourages boating and water skiing when wind conditions limit such activities on the larger lakes in the chain. Center Lake – Center Lake, for its namesake, is located between the northern halves of West Okoboji and East Okoboji lakes. This lake is a small shallow natural lake of 263 acres with an average depth of nearly 12 feet and a maximum depth of 17 feet. Although the entire eastern and southern shoreline has been developed, public lake access remains good at Center Lake with approximately 25% of its 4.7 miles of its northwestern shoreline as timber and wetlands. Silver Lake – The largest lake in the western third of Dickinson County, Silver Lake is a 141 acre natural lake located along the southwest edge of the City of Lake Park. Silver Lake has 1,041 acres of water with an average depth of 6 feet and a maximum depth of 11 feet. There are 9.6 miles of shoreline. The lake is surrounded by timber and marsh, and adjoins Silver Lake Fen.